How much stock allocation can I have, need to have and should I have in my retirement? Asset allocation considerations in retirement are determined by your personal: goals/objectives, overall financial picture (assets/income and fixed/discretionary expenses), risk tolerance (ability/willingness/need to take risk), required returns, withdrawal rates, taxes and capital market expectations. Management of risks (inflation, market/longevity) in retirement driving/constraining asset allocation are addressed by exploring: minimum/maximum/required stock allocations, trade-offs between stock allocation and expense reduction. Stock allocation in retirement is not some universal age-dependent glide-path that’s at times suggested, but it is a periodically updated allocation based on changing personalized context. A spreadsheet, which I found useful in exploring my own stock allocation space, is provided to help other retirees who might find it useful in exploring their trade-offs. Some arguments, pro/con rebalancing are be touched upon. What are some of the major goals/objectives of retirees? Retirees’ goals are to (cover expected liabilities in retirement): (1) cover their fixed (basic), discretionary (variable), emergency expenses (which can be allocated as part of liquidity consideration in the asset allocation process), (2) a long-term care (LTC) reserve (to cover the costs incremental to normal living expenses for about 3-5 years of care for one of a couple assuming the other will provide care to the first to need it), and possibly (3) a discretionary (except in cases when a family member is disabled which might make it necessary) bequest allocation (to family, charity, etc) which can also act as a safety valve to help deal with unbudgeted expenses or lower than assumed returns. For incremental long-term care reserve a starting ‘plug number’ might be in the range of $150K-$200K. For bequests, assets in excess of those needed to meet annual expenses, long-term care reserve and absolutely essential bequests (e.g. funds needed for the care a disabled family member) would be potentially available for additional discretionary or desired bequest reserves. We will dispense with the LTC/bequest goals since the W-S withdrawal rate (based on very conservative planning horizon) is sufficiently conservative in most situations; should one wish to include these, the simplest way would be by reducing the assets available for income generation accordingly) . Speaking of assets available for income generation, your home that you’re living in should not be included into the assets unless you are explicitly planning to sell it to generate income. Any lifetime income streams (e.g. pensions) will be used to offset fixed (and discretionary once fixed is covered) expenses. Available Assets can then be used to cover the expenses not covered by lifetime income sources. You will need to gather up information associated with all assets (e.g. bank and investment accounts, and real estate available for sale). The process is inherently iterative; if assets are far in excess of income needs/desires then there is opportunity to re-balance discretionary expenses vs. bequests; if assets are insufficient, even after introducing an acceptable level of risk, then it is necessary to re-examine and perhaps reduce proposed view of expenses before other heroic efforts are considered. To determine retirement income needs, we will not be using arbitrary/inappropriate preretirement income replacement percentages like 50% or 70-80% or 100% of income or working backwards from a (so called) “sustainable” withdrawal rates from assets (e.g. a rigid 3% or 4% of initial assets, then annually adjusted for inflation). Instead the retirement expenses should be calculated based on tracking actual expenditures in retirement, or for pre-retirees on actual pre-retirement expenses modified for additions (e.g. more travel) or deletions (e.g. no retirement savings). The implementation proposed here starts with identification of after-tax expenses which are then grossed up for taxes (to before-tax expenses) and then reduced for pensions (lifetime income streams such as OAS/CPP or Social Security and any applicable employment related pension). Expenses are separated into: fixed (such food shelter, utilities, insurance, type expenses which must be covered), and discretionary expenses which are more lifestyle related; in fact discretionary expenses can be divided into Level 1 (L1- refers to discretionary expenses which might take time to eliminate, such as costs associated with a 2nd home) and Level 2 (L2- refers to discretionary expenses which can be eliminated almost immediately, such as travel/entertainment/restaurants/gifts). Note that all numbers shown in red with light blue background are required inputs, while all numbers shown in black with light blue background are legitimate defaults (at the time of writing this post) but may be changed by you. However all other numbers without the light blue background are calculated and thus not permitted to be changed; should it have been changed accidentally you can restore default spreadsheet by reloading again. What people want from asset allocation? When speaking of asset allocation, we have typically moved beyond a risk-free portfolio and we’ll be allocating some of the assets to risky investments in the expectation of receiving an increased return, i.e. a premium for taking on the risk. In a 2009 blog post Asset Allocation II I discuss different asset allocation perspectives (in addition to definition of what constitutes an asset class and what asset allocation is and why it is important for investors). There I quote Richard Ennis’s “Parsimonious Asset Allocation” article from the CFA Institute’s Financial Analysts Journal (a great asset allocation read by the way) which dispenses with the diversification arguments (uncorrelated assets), some of the ‘hows’ of asset allocation, and targets directly the ‘whats’ or results that investors really want from asset allocation, and he identifies three things: (1) downside protection ( using “nominal- and real-pay U.S. Treasury securities of varying maturities”), (2) capture as much equity (risk) premium as possible without compromising downside protection (using “a global stock index fund”), and (3) some additional excess return (alpha) should the investor or her adviser be able to identify/exploit some market inefficiency or liquidity premiums . In order to simplify our discussion and due to the challenges associated with such ‘alpha’ opportunities, we will focus only on the first two of these categories, “downside protection” and capturing “equity risk premium”, and how these can be used to build on top of the Waring-Siegel (abbreviated as W-S) approach to achieve retirement goals/objectives and manage the risks in retirement. Since we are contemplating additional risk (stocks in this case) in our portfolio, we’ll first review (and understand) what ‘risk tolerance’ is about. Risk Tolerance’ is a measure of the combination of ‘willingness’ and ‘ability’ to take on risk. ‘Willingness’ to take risk is a qualitative measure for one’s inclination to be exposed to risk (or more precisely the unknown outcomes). Some try to assess one’s willingness to take risk by a series of hypothetical questions about one’s willingness to accept some percent of portfolio losses in the future. But better qualitative indicators might be how one actually behaved in the past. So an indicator of low willingness to take risk might be: historical and/or current asset allocation only or primarily into CDs/GICs and/or government bonds, difficulty sleeping at night after stock market drops 10-15% and if significant portion of your portfolio was allocated to stocks and you sold much of your stock allocation during the 2008-2009 market drop. On the other hand if you historically/currently feel comfortable with a significant stock allocation in your portfolio, you don’t lose sleep when the market drops 10-15% because you are invested for the long-run, and rather than selling on the way down in 2008-2009 market rout you rebalanced your portfolio to your target asset allocation and took advantage of opportunity to buy cheap assets (stocks) and sell appreciated assets (bonds). Nobody likes to lose money, but some people can be quickly demoralized into selling assets which are dropping or have dropped in price even if the assets were intended to meet long-term expenses far into the future even though they have the necessary liquidity to meet their short and intermediate term needs. So ‘willingness’ is a qualitative psychological measure of our predisposition to risk. When willingness and ability to take on risk are both low or are both high then, the combined effect of these, called risk tolerance is clearly low and high respectively. The more difficult situation is when there is a tension between willingness and ability; i.e. willingness is low but ability to take risk is high, or vice-versa i.e. willingness is high but ability is low. Factoring in ‘need’ to take risk (as in the former case) or a redefinition (up or more likely down in the latter case) of goals/objectives (fixed and discretionary expenses, bequests, etc) specified in the IPS may be helpful to resolve the deadlock. ‘Need ‘to take risk is driven, as noted by Ennis above, by the desire to “capture as much equity premium as possible without compromising downside protection “. The proportion of the portfolio allocated to stock determines how much of the potential equity risk premium can be expected to be captured, but at the same time determines the downside portfolio risk as well. So the need to take risk is guided by the required portfolio return to achieve goals and objectives. So we can assess “willingness” by looking at our current portfolio allocation to risky assets and how we behaved during past crises. Is our “willingness to take risk” low or high? The three major risks in retirement are: longevity risk, market risk and inflation risk. Longevity risk is the risk of outliving one’s assets i.e. running out of money before dying because one did not assume a sufficiently conservative planning horizon, e.g. what not to do is just planning to life expectancy (from current age) which 50% of the population outlives by definition. Market risk is the risk that an unexpected market crash (e.g. 2008-2009) in general or a sustained bear market will result in a one large or sequence of smaller negative returns which then compounded by annual withdrawals will grind assets down to exhaustion well before one dies. Inflation risk, the silent killer, will gradually corrode the purchasing power of constant nominal annual withdrawals or income streams (annuities and unindexed corporate pensions), so that even a 2.0% annual inflation rate will reduce the purchasing power of $1 will half (54¢) over a 30 year retirement. How to tackle these retirement risks? For inflation risk, Waring and Siegel’s paper demonstrates that annually repeating their virtual fixed (though decreasing) term annuitization even for a constant real rate of return (of 0.6% at the time of writing their paper but since dropped to about 0.2% now) , the resulting nominal income stream offers some level of inflation protection well into one’s “eleventh decade”, primarily due to increased maximum permissible draw driven by the decreasing term of the fixed virtual annuity each year as one ages (i.e. it has some built-in inflation protection on the nominal distributed income, which by the way is composed by a combination of the real interest on remaining assets and the return of one’s own capital). So one bookend, the maximum, was the maximum was discussed in the ’market risk’ section above. The other bookend might be the minimum stock allocation needed to increase the (risky) expected real return sufficiently: (1) to make expected maximum draw rate equal required total expense draw rate as a percent of assets (of course when the actual return is lower than the expected return, we’ll have to absorb some of the shortfall by reducing discretionary spending which acts as shock absorber), or (2) to generate an expected return to restore nominal assets after drawing the Total expense from the portfolio, or (3) to restore real assets after Total expense draw. In Fig. 2 we assume ‘Real risk-free return’=0.2%, ‘Inflation’=2% and an Equity Risk Premium = 4%; ’stock ‘volatility’ or ‘standard deviation’ (SD)=16%. Therefore ‘nominal risk-free return’= 2.2% (0.2%+2.0%) while nominal stock return= 6.2% (2.2%+4%). By just plugging in the appropriate numbers in the Fig. 1 where stock allocation is input, then in Fig. 2 portion on the spreadsheet one readily can see that a 25% stock allocation would boost expected return by 1%/ year (from real 0.2% to real 1.2%), while a 50% stock allocation would boost expected return by 2% (to real 2.2%) so at least in nominal terms it might be expected overcome on the average the 2% inflationary headwind over this retiree couple’s life; all this is assuming that they can bear the income volatility accompanying the level of stock allocation. Waring and Siegel point out that the standard deviation of the income would be the same as that of the portfolio returns. So asset allocation plays a significant role in dealing with all three retirement risks: longevity risk, market risk and inflation risk. But it won’t work for everyone; those whose willingness and ability to bear risk are very low, specifically those whose fixed expenses cannot be reduced proactively/voluntarily to a level to where some portfolio risk can be assumed by transforming some fixed into discretionary expenses to create some shock absorbing capability in the portfolio, might have to even accept (partial) annuitization which will likely lead to a involuntary but gradual/continuous reduction of the buying power of a nominal annuity, with inflation eroding coverage for ‘fixed’ expenses. Finding the balance between need/desire to spend and asset protection for the future, and having the ability to handle the income volatility when markets drop (even precipitously), to have sufficient remaining assets to fight another day and then benefit from the historical/eventual market rebound, makes asset allocation an essential tool to meeting retirees’ goals/objectives articulated in their IPS. Minimum stock allocation To get some handle on a minimum stock allocation (assuming 4% equity risk premium, i.e. the expected real equity returns are real risk-free return plus 4%) let’s explore the return required to replace the withdrawal (rate), in order to preserve the nominal value of the assets (similarly we could explore the return required to preserve the real value of the assets). So disregarding return and income volatility for the moment, then assuming 0.2% real return with an inflation of 2%, then the risk-free or 0% stock allocation (entered in Fig.1) would deliver a nominal return of 2.2%; similarly nominal 3.2% and 4.2% return would be delivered at 25% and 50% stock allocations, respectively as shown in Fig.2 for an “Equity Risk premium”=4.0%. Therefore, when we draw 3.4% of assets then to just maintain on the average the nominal level of assets we need to earn 3.4% return which in this case would imply increasing the portfolio risk to a minimum of 30% allocation to stocks. The formula for Minimum Stock Allocation = (Required Return-RiskFree Return) / (Stock Return-RiskFree Return). If we would like to compensate also for inflation then the minimum stock allocation would have to also compensate for the 2% assumed inflation i.e. for a total return of 5.4% (3.4% draw + 2% inflation) requiring 80% stock allocation. Trade-offs in managing risk in retirement between fixed expense reduction and stock allocation With these assumptions (real fixed income return essentially zero (0.2%), 16% standard deviation for stocks and zero for fixed income assuming relatively short maturity safe fixed income investments, equity risk premium 4%, and zero correlation between fixed income and stocks) to increase return rate by 1% we must add 25% additional stock allocation which brings with it increased volatility of 4.0%; but note that if equity risk premium is only 3% (rather than 4%) then we’d only get 0.75% expected average return improvement for each additional 25% allocation to stocks. And as indicated above, maximum stock allocation is constrained by downside protection necessary to protect income coverage for fixed expenses. Looking at how maximum withdrawal rate changes as real return changes under the Waring-Siegel strategy, each 1% increase in real (risk-free) rate translates into about 0.5% of increased maximum withdrawal rate. So each incremental 25% stock allocation delivers only 0.5% of incremental maximum withdrawal rate. So in reality the most effective control mechanism for retirees to combat the major risks in retirement (longevity/market/inflation) is expense minimization in general and fixed expense minimization in particular, in order to prevent excessive withdrawals from reducing assets to a point of no return. Age dependent stock allocation? As to the debate about the traditional view that you should be decreasing your stock allocation as you age (e.g. allocating (100-age) or (110-age) percent to stocks vs. just using an age independent balanced portfolio (e.g. 60% stocks and 40% fixed income) or even the more radical recent proposal to actually increase the proportion of stock with age, my view has not changed in years. The stock allocation is not determined exclusively by age, but it is determined by the individual’s or couple’s circumstances, the most important of which is risk tolerance, as discussed above. But having said that age not the governing factor to stock allocation, it can come into play especially as one examines near end-of-life scenarios due to investment horizon considerations. When someone or some couple is in their 90s, then using the Ellis rule-of-thumb of allocating 10 years’ worth of expenses to fixed income, and assuming annual costs (depending on the level of support that might be required) ranging from $60K-$120K+/year, so a corresponding fixed income allocation might be $600K-$1.2M+ which would effectively drive most retirees in their 90s into 100% fixed income allocation. (The W-S strategy for 90 year old couple (using the very conservative female as a proxy for joint mortality) allows 6% and 7.2% maximum draws at ages 90 (17 year planning horizon) and 95 (14 year planning horizon) respectively; for male mortality the corresponding draw rates are 8.4% (14 years) and 11.3% (11 years) respectively. As you’ll note the W-S assumed planning horizons are quite conservative, so if necessary there may be some opportunity to relax these. ) But driving retirees to a higher stock allocation in general is the need to combat inflation; this however is less compelling of an issue for retirees in their 90s typically since the corrosive effect of inflation is less damaging over a shorter 10-15 year horizon vs. a potentially 30-40 year horizon for a 65 year old couple. Therefore a higher or even an exclusively fixed income asset allocation, with its lower associated market risk, would be acceptable. Of course, if assets in the 90s are still well in excess of $2M+ in this example, then correspondingly higher ability to bear risk would still permit a substantial stock allocation, but willingness/desire and ability to manage investments, especially for DIY investors, would still limit exposure to risk unless driven by substantial bequest motives. We are now ready to look at some examples; the spreadsheet is accessible at the following link. NOTE: If you are ready to try it now…In Microsoft Excel 2007 the link opens in Excel Online. Then click on ‘Edit Workbook’ on top and select from dropdown menu ‘Edit in Excel Online’ OR on the top far right side click on the 3-dots and from dropdown menu select “download a copy” . You are now ready to go! (A simpler version of this spreadsheet is now available here.) The most important moving parts influencing the analysis are: assets, expenses (fixed and discretionary), and sources of lifetime income (pension income). Other important factors are age (an important element driving planning horizon), tax rate and real risk-free rate available in the market. Here with a risk-free portfolio the significant assets and pensions appear inadequate to meet our goals/objectives. Note that the Total expenses (fixed and discretionary) after gross up for taxes and offset by pensions amount to 34.0K which is 3.4% of assets but above the maximum withdrawal rate of 2.76%. One option would be to try to reduce discretionary expenses so they fit within the maximum envelope. Reducing discretionary L2 expenses from $15K to $9K gets us to a Total (Fixed+L1+L2) withdrawal rate of 2.7% which is below the maximum withdrawal rate of 2.76%. Or, we could return to Scenario 1A and leave L2 expenses at $15K and let’s examine Fig. 3 which looks at some boundary conditions for adding some stocks to the portfolio. Rule-of-Thumb #4 (RoT #4) suggests that a minimum of 32% stock is required, while Rules-of-Thumb 1, 2 and 3 cap maximum stock allocation at 40%, 80% and 66% respectively (all above 32% minimum); depending how much we value each of these criteria we might consider a stock allocation ranging from 32% to 60% (e.g. if RoT scenario of 100% stock drop is considered highly unlikely) ; 32% and 60% stock allocation, when plugged into Fig. 1 sequentially, deliver real returns of 1.48% and 2.6% respectively (shown in Fig. 2)(though not risk-free). Note in Fig.1 Expected Real Return is automatically updated with each stock allocation change. Using 32% which boosts expected real return from 0.2% to 1.48%, and the MaxDraw to 3.44%, thus expected to cover Total expenses as predicted. Of course we are now using risky assets and the 1.48% might be expected but is not guaranteed; should it come in lower, then expected assets will be lower and we will have to reduce future discretionary expenses. Suppose that we wanted to tackle Scenario 1B except the available assets are $500K instead of $1000K. This picture looks somewhat grim, since MaxDraw at $13.8Fig. 1, which reduces Total expenses and increases RoT #3 maximum from 46% to 67% stock allocation. Also looking at some opportunities that we can glean from the Fig. 3 Min-Max analysis, we observe that the least stringent maximum is RoT #3 (at 46% or 67%) eliminates all minimum RoTs but RoT #6 of 27%. But any non-zero stock allocation would violate RoTs #1 and #2 which in this case indicate that any non-stock allocation would put at risk even more of the Fixed expenses of $16.5K; in fact, even with Stock Allocation= 0%, the Max.Draw permitted with the W-S process would be 2.76% or $13.8K which is $2.7K below the Fixed expenses. But if we are prepared to forgo the protection of the Fixed expenses from say a 50% (or more) stock drop, the 27% stock allocation would raise expected real return sufficiently to increase MaxDraw to 3.32% (driven by the average return expected from the stock allocation to be a real 1.28% or nominal 3.28%) and could be expected to cover the fixed expenses. But if we insist on being able to absorb with 50% stock drop without affecting coverage of Fixed expenses, then we’ll need to either: (1) start reducing Fixed expenses (by $2.5K or 6.25% to $37.5K we could achieve income stream using W-S approach with a risk-free portfolio yielding just 0.2% real, or (2) consider self-annuitizing for a 20 year fixed term (to age 85) $324K at 0.2% real risk-free rate to generate $16.5K/yr, and simultaneously buying at age 65 a $25K/yr longevity insurance with income starting at age 85 which costs for a male $50K and for a couple $87K pricing from Forbes article (available only to American retirees); at 2% inflation the $16.5K/yr income in 20 years become $25K) or (3) consider perhaps partial annuitization; it all depends on our risk tolerance. This suggests that unless we have some very unpleasant sequence of returns problems, we might even consider proceeding with the 27% stock allocation. In this post I have used only two asset classes: fixed income (implemented with essentially risk free GICs/CDs or high quality short term bond funds in home currency) and stocks (US CD rates are slightly lower than those available in Canada, but not by much.) Figs. 4-8 in this spreadsheet consider various aspects of implementation of such an approach: starting with your existing assets already specified in Fig. 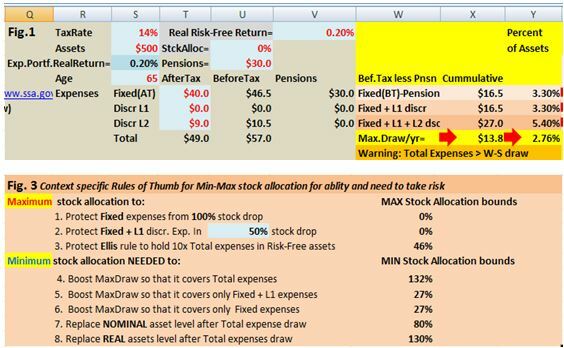 1 of the spreadsheet using the last Scenario 1F with Assets=$300K and Stock Allocation= 43%, the current Stock Allocation in dollars ($), the target Stock Allocation in percent (%) from the analysis such as discussed in the earlier portion of this post, you get the fixed income and stock allocation changes (in dollars) that you’d have to make to achieve your target allocation. We then continue with Figs. 5-8 to further sub-allocate the stock portion of the portfolio using different approaches and ETFs to implement the desired portfolio. Once we have determined the fixed and stock allocations of our current portfolio, then using our target portfolio’s percent of stock allocation, we can then calculate the changes required to our current portfolio to align it with this new target. Fig. 4, where this is referred to as “inter-asset class” (i.e. between stocks and fixed income) rebalancing, shows how this calculation is done. You just need the required inputs, shown in red. (Note that total portfolio size is taken from the “Assets” specified in the top left-hand corner of the spreadsheet and one needs to only enter the dollars allocated to the fixed income portion of the portfolio, and the target stock allocation; everything else is calculated automatically. Figs. 5-8 show some of the possible “intra-asset class” allocation approaches that Canadian and American investor might take; the overall asset class referred to here is stocks, which may be further broken up into (sub-) allocations to US, Canadian, international, and emerging markets with some of the possible approaches that one might take. Fig.6 shows a simple (three ETF) implementation of the stock portion of the portfolio for a Canadian investor. Here the implementation is done Vanguard (Canada based) ETFs with stock allocation is equally divided into three markets: Canadian (VCE), US (VUS CAD-hedged or VUN un-hedged) and International (VEF CAD-hedged or VDU un-hedged, based on FTSE developed ex-North America index. i.e. no emerging markets allocation). Note that a Canadian might choose CAD-hedged or un-hedged versions of the US/International allocations. A Canadian retiree who is a snowbird spending significant time in the US, might choose the Vanguard Canada based un-hedged version of the US market ETF VUN or even the Vanguard US based USD implemented VTI ETF. Fig. 8 for Canadian investors, builds upon Fig. 6 and Fig. 7 and further diversifies the stock allocation by splitting each of the US and International stock allocations (50:50) into CAD-hedged and un-hedged portions as shown below and did not overweigh the emerging market allocation. The mechanics of rebalancing have been built into Figs. 4-8 of the spreadsheet. There is a no absolute consensus about the value and purpose as well as timing of rebalancing; i.e. is it worth the trouble? As discussed there are two kinds of rebalancing considered here: the” inter-asset class” which to a large extent is the risk control mechanism, i.e. can be used to control our downside risk. The “intra-asset class” rebalancing may be considered as an approach to periodically drive us to sell some relatively overvalued stocks (regions) and buy relatively cheaper stocks (regions). There are also some who argue that buy-and-hold is the right approach (i.e. let the winners run or momentum approach) and do rebalancing only using new money (income or interest/dividends). The whole rebalancing topic is complex as it also involves tax considerations, so I would be inclined to say is that it should be done opportunistically except when downside risk considerations require action. So there is no generally applicable answer to retirees’ stock allocation. The decision on the most appropriate stock allocation is very personal. The drivers of what’s appropriate asset allocation include many of the key inputs to an Investment Policy Statement such as: goals/objectives, overall financial picture (assets/income and fixed/discretionary expenses), risk tolerance (ability/willingness/need to take risk), required returns, withdrawal rates, taxes and capital market expectations. Management of risks (inflation/market/longevity) in retirement driving/constraining asset allocation are addressed by exploring: minimum/maximum/required stock allocations, trade-offs between stock allocation and expense reduction. This tool/spreadsheet was useful for my exploration of various approaches given my circumstances. (A simpler version of this spreadsheet is now available here.) I hope that it might also be useful to other retirees to explore their asset allocation space in their search for a solution that they can live with in retirement. As usual, any comments/suggestions/views are always appreciated. In comparing the spreadsheet you posted in the W-S review article, with the spreadsheet you posted for this article, I noticed that the spreadsheets gave different values for the max withdrawal rates. I believe this is because the spreadsheets use different values for longevity. The first uses 95 years, while the second uses some other value that I haven’t figured out yet. (I’m still looking for columns i and e!) Correct? I believe the difference is the assumed ‘Real Risk-Free Return’ in the W-S paper was 0.6% whereas here it is 0.2%. Sorry, I had changed the max age on the first spreadsheet from 120 to 105, which caused the difference in the max withdrawals. And I see all the columns now. Thanks again for the great spreadsheet. What an amazing treatise! The only thing not clear is why 51 is chosen in the indirect function ‘=INDIRECT(“I”&(S4-51)). Thanks, its a mechanism to refer to the row in the PMT Table because the row number for age 65 is row 6 in Table and age-51 gets to row six. Got it. In the W-S Table, what might the Max stock formula represent ?’=(($AA$2-Y5)/$AA$2)/$Z$2. 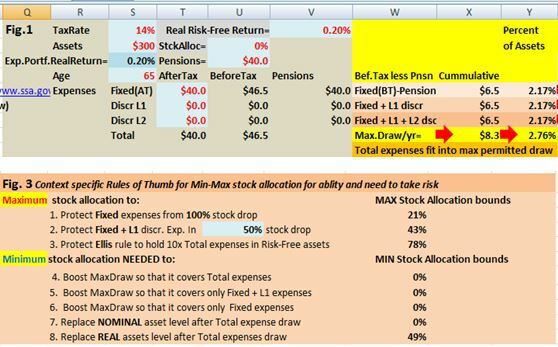 It is calculating the ratio of the difference between the max draw and the cumulate assets to max draw. What I don’t get then is the ratio of this derived number to the stock drop. How do you interpret this ratio especially if it goes negative, as you reduce the asset value. I am not sure what cell on what sheet you are referring to…but whenever there is a Max Stock calculation result <0 it means that your permitted stock allocation =0% (at least by this calculation).. I was referring to Cell Z5.that shows a 3.7% in the W-S spreadsheet. Still cannot understand the logic behind the cell formula in the W-S spreadsheet in cell Z5. (AA2-Y5)/AA2=(2.47%-2.43%)/2.47%=1.8% (In $ terms =0.27/14.82 =0.018. Follow up to this point. The difference between the needed amount for Fixed+F1 and the max draw is 1.8% of the max draw amount. We do not need the full draw. There is a small surplus ($270). How does one jump to the next step to determine max stock investment amount by dividing this number by the assumed stock drop %? Does it mean that one can invest an additional 3.7% or $540 of total assets or $270 on top of 90% after generating a fixed income? I am still having trouble with locating the cell/sheet you are referring to. Can you please try your example again and ask your question with reference to that. Sorry we are having communication problems. the 100 Stk.Drop case (gives 46% max asset allocation for my example) and copy to AG5 (50% stack drop case ), I get the same results as from the other eqn in use in the web accessed spreadsheet (92% max asset allocation for my example ). Would you not think that for the 50% stock drop, the value should be 46%/2= 23% not 46%*2=92%, since the risk has halved. I follow the example now that there are $ values. Lets say your risk tolerance is such that you prefer to keep $200 in fixed income, yet you want to increase your Ret(Nom) to 4.34% using an equity risk premium of eg. 4.65% instead of the recommended 3.5% in the spreadsheet to provide an expected real return of 2.34%), with $100. ie. willing to loose all $100, instead of assuming a 50% stock drop and putting more funds into stocks. First time I am getting a proper handle on this retirement planning business. Very insightful. Rebalancing, asset allocation and dollar cost averaging, to deal with the black box of options trading, short trading algorithms and whatever the financial industry has cooked up to make the task of understanding what takes place in the stock market world virtually unfathomable. ← Auditor: Ontario fails to protect pension plan members! And Nortel pensioners await resolution 7th year post bankruptcy.